The Whistler Blackcomb Foundation – Thank you to the Foundation, and Executive Director Mei McCurdy, for generously providing us with a grant that allowed us to do an extensive renovation on our Dandelions Infant Program as well as Sprouts and Periwinkles playgrounds. 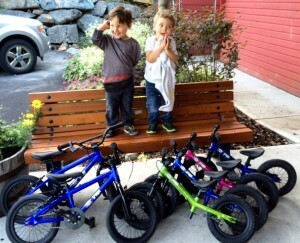 Max and Jamie are excited to ride! Out on a Limb Landscaping – Thank you to Carolyn Rodgers & her crew at Out on a Limb for all of their fantastic work keeping our yards beautiful. The Whistler Children’s Centre would also like to thank all the volunteers and businesses that help us put on a successful Father Daughter Dance every year. The Fairmont Chateau Whistler has been an amazing source of support for a number of years. An event like this would not be possible without everyone’s help and hard work. 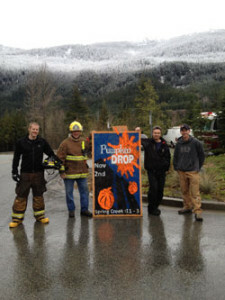 A big thanks to Fire Hall #3 for helping us make our annual Pumpkin Drop Fundraiser a success.